Sing, rejoice, listen, move, meditate, and pray! 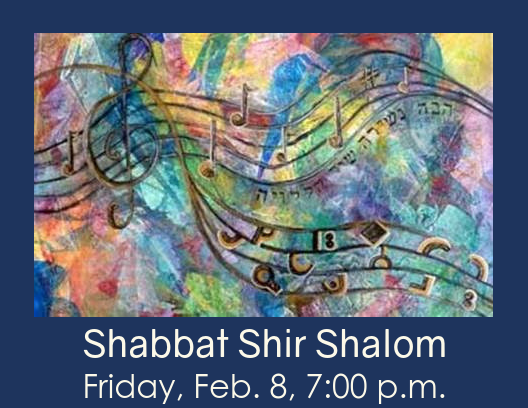 Come enjoy Shabbat Shir Shalom-our annual service that is almost entirely musical. Led by about 50 Temple Beth Shalom members with voice and instrument (including the Kol Hakavod Ensemble and Kids' Choir), even the sermon is in song! The Feb. 8, 2019 service was beautiful and meaningful. Please read on for Cantor Gostein's thank you to all who helped. As the director of the Shabbat Shir Shalom musical service, I have many people to thank: Rabbi Freedman and Rabbi Cohen, for their great support of musical endeavors at Temple Beth Shalom and their leadership at the service tonight; the Temple Beth Shalom Board for their support of musical programs in our congregation; Noreen Long for creating and printing the daf t'filah; Marissa Wright for creating our slides and heading up many logistical coordination issues for the service, including the Oneg; Jennifer Kramer for all her help in publicizing the event; Patti Bridwell for her excellent oversight to make all run smoothly; JC Dahlberg, for his extra work on facilities / setup for the service; Steve Feibus, Dan Hemme, and Andres Trevino for their sound wizardry, ensuring the music gets to your ears even better than it comes out of our mouths and instruments! Christy Esmahan and Diane Gilmore for coordinating our rehearsal "onegs"; Jennifer Bloom Greenberg and Martha Feferman for serving as a sounding board for congregational musical pursuits in their roles as Music Committee Chairs; Harriett Saikin and Barbara Robin for coordinating efforts for the extra-special oneg, and to the many people who contributed help and treats to it (see below); and especially all of the amazing musicians, listed below, who generously gave their time, energy, and talents to enrich our prayer experience! In addition, I'd like to thank everyone who came for adding your voices and spirit to this service and supporting your fellow congregants by your presence! It is a joy to celebrate Shabbat in this way with you all.